Does the Bible need to be saved? Over the course of the centuries, Bible scholars and publishers have increasingly added "helps"-chapter divisions, verses, subheads, notes-to the Bible in an effort to make it easier to study and understand. In the process, however, these have led to sampling Scripture rather than reading deeply. According to author Glenn R. Paauw, the text has become divorced from the Bible's literary and historical context, leading to misinterpretation and a "narrow, individualistic and escapist view of salvation." Rather than being a culture-shaping force, the Bible has become a database of quick and easy answers to life's troubling questions. But these deficiencies can be corrected by engaging in what the author calls "big readings." In these pages Paauw introduces us to seven new (to us) understandings of the Bible as steps on the path to recovering one deeply engaged Bible. With each "new" Bible presented, deficiencies in how we currently interact with the Bible are explored, followed by recommendations for a new practice. The Bible's transformative power is recovered when we remove the chains Christians have applied to it over the centuries. The Bible does not need to be saved because of any defect in itself, but because we have distorted and misread it. Saving the Bible from Ourselves provides students of the Bible a new paradigm for reading and living the Bible well. 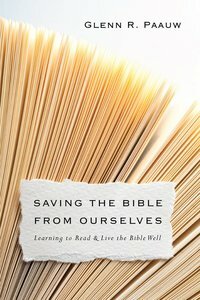 About "Saving the Bible From Ourselves"